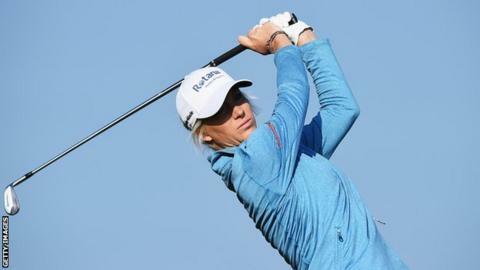 British golfer Melissa Reid has said she is now enjoying playing again after considering giving up the sport. The 27-year-old's mother, Joy, died in a car accident in 2012 in Germany while she was supporting her daughter in the German Masters. Reid finished ninth in the British Open in August and will be part of Europe's team for this month's Solheim Cup. "A year ago I couldn't imagine I'd be in this position. I'd considered giving up the game," she told BBC Radio Derby. "It was a hard time but things are definitely on the up," added Reid, who won the Turkish Airlines Open in May. Reid, from Derby, puts the turnaround down to a training camp that she and coach Kevin Craggs held in Dubai at the end of last year. "We were having a boot camp, which turned out to be the best thing we've ever done," Reid said. "We sat down and I was very honest with him. In the end I think we were at breakfast for about five hours. "It was nice to get a few things off my chest and we've moved forward since then. "I'm enjoying it again, that's the main thing," continued Reid. "Everything in my life is stable and settled now. I'm enjoying playing, practicing and training and I'm really excited for September. "It feels really epic to be in the team. It was one of my goals at the start of the year but I knew it would be tough to do. I'm buzzing I'm back in it because missing one Solheim Cup wasn't very nice."